Because the possibilities are endless, bedrooms can be problematic to light. The bedroom is one room in which you can do just about anything to light up the space, whether you want to light from up above with overhead lighting, the side with wall scones or from the surface with table lamps. Our suggestion? Light from all over to give your room as much depth, detail and light as possible. Options are key, and the more lighting your space has, the more options you will have down the road. Where to start: Overhead lighting. Overhead lighting is usually the most complicated to install and the most dramatic, so start there and work your way out. Of course, there are many overhead lighting options, ranging from recessed lighting to ceiling fans and chandeliers. This choice all depends on your specific wants and needs, though in Arizona ceiling fans tend to be the obvious choice. Once you have your overhead lighting taken care of, work your way to the bed. 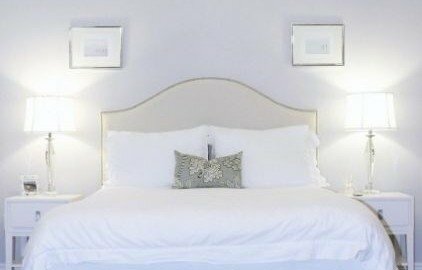 Balance and symmetry are the most appealing to the human eye, so think of adding a pair of matching table lamps or sconces to either side of the bed. This will draw the eye to the focal point of any bedroom, the bed, and then bring the eye out towards the lamps or sconces. If there are any spaces left in your bedroom that are not properly lit, light them. A lot of people have a chair in their bedrooms used for reading or watching TV. A floor lamp is a perfect choice for these smaller spaces; not only will it add light, it will also add depth to the room by creating even more interest with lines and heights. If you followed these tips, your bedroom now has overhead lighting from up above, lighting at eye level on either side of the bed, and a tall floor lamp with long lines which will bring the eye up and down again. By lighting your bedroom from varying heights rather than a stagnant height throughout, you will create visual interest and depth in your space.